Alpharetta Historical Society Meeting. "The Story of Sandy Springs during the Civil War"
Secret Gardens of Johns Creek garden tour presented by Johns Creek Beautification. 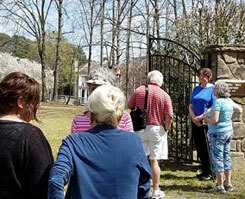 The Johns Creek Historical Society will be part of the garden tour. Want to hear about future programs, activities, and history discovered? It's time to become a member or renew your membership! Read more about membership. Join online or print a form to mail. Six Bridges Brewing is now open in Johns Creek and it's partnering with the Johns Creek Historical Society to use local history as part of its identity. The name Six Bridges refers to the 6 river bridges that historically existed within Johns Creek's borders, some brews will have names of communities and crossroads of the past, and Joan Compton, muralist and president of the JC Historical Society, painted a map mural that locates the 6 bridges and illustrates bits of Johns Creek history. History in a brewery? Yes, and it's now open! For the 100th Anniversary of the end of WWI, here is a story of two veterans of World War I posthumously awarded the Medal of Honor. Their heroism had been ignored for almost 100 years due to their race and religion. See the YouTube video of this story told on the CBS Evening News in 2015. An historic resources survey report was completed for GDOT in preparation for the Rogers Bridge pedestrian bridge project. The March 9th initial report determined the bridge had no unique historic value. However, based on additional information from the Historic Bridge Foundation and input from the Georgia Department of Historic Preservation, Rogers Bridge is now recommended ELIGIBLE for the National Register of Historic Places. 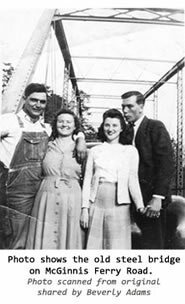 Read the letter from the Historic Bridge Foundation that describes the construction of the bridge and their basis for its historical significance. Larry Garrard has reactivated a website to collect and share written memories of life in Newtown and stories of earlier residents. Read memories collected so far or submit your own memories of Newtown when it was a rural farming community. Newtown Community Nostalgia website. This Newtown Nostalgia website is such a great idea that the JC Historical Society website will soon try out a similar capability to capture written memories of the other 3 historic communities in Johns Creek: Ocee, Warsaw, and Shakerag. 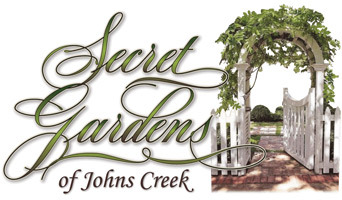 of this year's Secret Gardens of Johns Creek garden tour. Look for us at the tour stop located at 220 Rod Court in Chartwell. We'll have displays and stories of the history of the land and earlier inhabitants of the area that is today's City of Johns Creek. 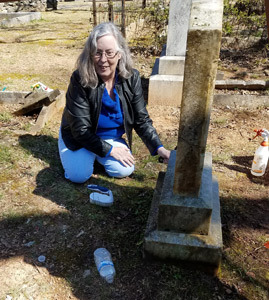 Several of our historical society members participated in cleaning grave markers at the Old Roswell Cemetery on Saturday, March 23. Our thanks to the Roswell Historical Society, their Cemetery Chairperson, Jan Johnson, and Pat Miller, the cemetery section leader who directed our work (also a member of the JC Historical Society). 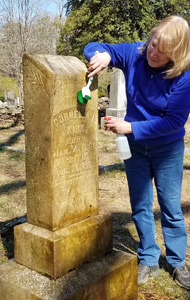 It was a chance to help another historical society, but also to learn the correct process for cleaning cemetery grave markers and monuments. 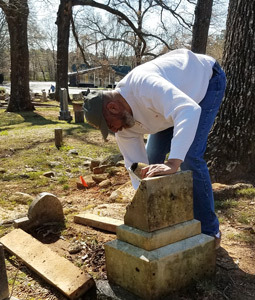 The Old Roswell Cemetery is 10 acres in size, much larger than any cemetery in Johns Creek, but the knowledge and expertise that the Roswell Historical Society has gained over the years is extremely helpful to us in any future efforts to help restore or preserve cemeteries within Johns Creek. We thank the Roswell Historical Society's Cemetery committee for generously sharing their experience. Read more about the work of Don Wells and Mountain Stewards to identify and map trail trees. 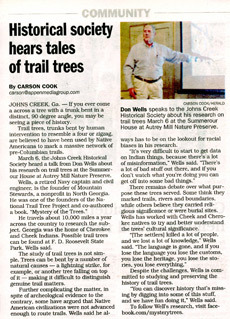 Read the Johns Creek Herald article about Don Well's presentation March 6th. Thanks to Autrey Mill Nature Preserve and the City of Johns Creek for providing a location for our March 6th meeting. The old sign posts that use to mark important local intersections? In our rural past, these posts would have been at major road intersections in all areas of what is today's Johns Creek. Most have disappeared as roadways moved, intersections widened, or weather and age took their toll. Only a couple are still standing and they are badly deteriorated. Fortunately, Tom Udell, Deputy Director of Public Works - Traffic, photographed the few he found over the years and recently the Spruill/Buice sign post was donated to the Johns Creek Historical Society as a piece of local history reminiscent of the days of dirt roads, little traffic, and rural farms. Larry Garrard talking about the old barn next to the 1800s house where he grew up. Our January program was focused on Newtown, one of the four historic communities in today's City of Johns Creek. Larry Garrard and others with deep local roots talked about the history of the area and attending Newtown School. Our thanks to Park Place and the City of Johns Creek for allowing us to use the old Newtown School building for this meeting. Read more about the meeting in the Johns Creek Herald article by Carson Cook. Our thanks to Mark Burkhalter for leading the historical society on a tour of the old Warsaw School building in December. It was a wonderful chance to learn about the building, how Mark saved and carefully renovated it, and hear memories of attending the school when this area was still rural. 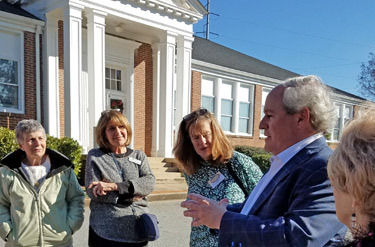 We in the City of Johns Creek owe Mark our gratitude for preserving part of the area's history by repurposing the old school building while maintaining its historic integrity. Mark has also offered to let us copy his collection of Warsaw School photos and documents. Several people will be needed to help with the scanning. Contact us at info@johnscreekhistory.org if you want to help. Thanks Shady Grove Church and Linda Swafford for organizing this event! On Saturday, August 25th, six members of the Johns Creek Historical Society met with Shady Grove Church members and other long-time residents of Shakerag to hear old memories of life in the community and scan photos and documents they brought to share. Please contact us at info@johnscreek history.org if you have memories, photos, documents, or objects from the Johns Creek area's past or if you would like to help us research and capture local history. As part of its mission to preserve and promote local history, the Johns Creek Historical Society has started a project to collect recorded memories and family stories of this area's past. We've made a test run of the process by interviewing Judy Webb, a long-time resident with deep family roots in the area, who is known for her community activism and knowledge of local history. DO YOU HAVE MEMORIES or FAMILY STORIES of this AREA's PAST? We're compiling a list for the next set of interviews. Let us know if you are a descendant of the early farm families of this area or are a long-time resident with memories of the area when it was still a rural farming community. 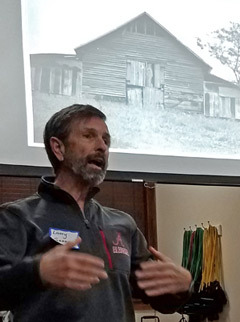 The oral histories collected will be retained in the Johns Creek Historical Society's archives for research, education, and promotion of local history. 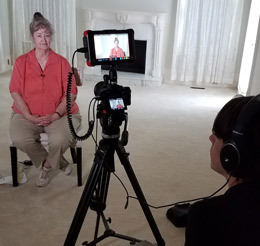 Our thanks to the City of Johns Creek Communications Department for videotaping and editing the oral history interviews.